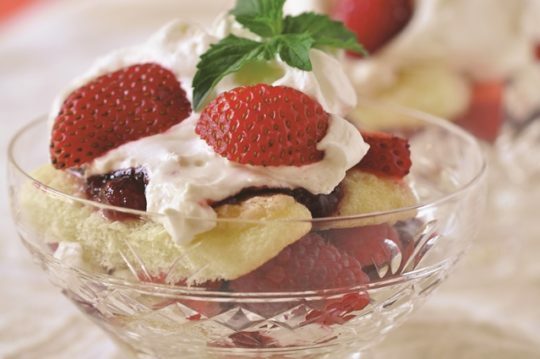 Light and delightful, strawberries layered with a luscious cream cheese layer and ladyfingers makes a simple, but amazing quick desert. This recipe is from Holly Clegg’s trim&TERRIFIC Eating Well to Fight Arthritis cookbook cookbook. In small bowl, mix together preserves and orange juice. In mixing bowl, cream together cream cheese, sugar, and vanilla until light. Mix in whipped topping reserving, 1/2 cup for topping. Line bottom of an oblong small dish with split ladyfingers. Layer with preserves mixture, cream cheese layer, and top with strawberries. Repeat layers with remaining ladyfingers, preserves and cream cheese layer. Carefully top with thin layer of remaining whipped topping. Top with remaining strawberries. Cover, refrigerate several hours or overnight. Terrific Tip: Feel free to use your favorite berry in place of strawberries. Recipe from Holly Clegg’s trim&TERRIFIC Eating Well to Fight Arthritis cookbook. Visit Holly’s YouTube channel and website or blog for more recipes and tips.